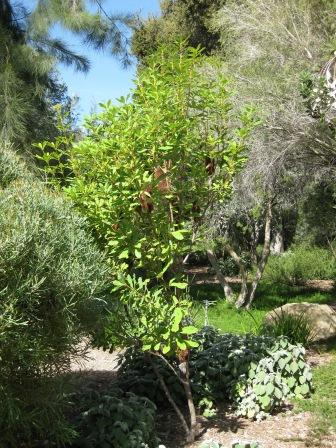 Tall shrub to small tree with yellow flower heads appearing in fall-winter. Ornamental species for well-drained light to heavy soils in partial shade to full sun positions. 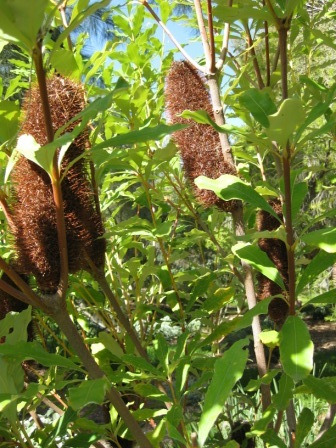 Two variants available: B. conferta var.penicillata and B. conferta var. conferta. We have been growing the form from Queensland, B. conferta var pencilliata with excellent results wherever we have planted it. It is fast growing, in some situations they have become large shrubs in no time. They flower when grown in containers, approx 3 years from seed. They have attractive dark green leaves with white underneath. 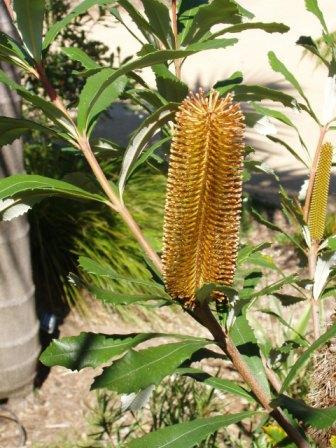 Can be confused with Banksia integrifolia but it is more shrubby has crowded flowers and closed seed follicles. Excellent along the coast or inland (Ojai). Fast growing screen or specimen.